Thread: Where to train jumping and droping skills in Phoenix? My name is Magda and I'm from Poland. I have just moved to Phoenix few weeks ago and I'm looking for a little help with the trails here. To be honest I'm more into downhill biking than all mountain/enduro and I don't really have much experience with shredding up and down like you do it here. Anyway, I decided to buy an enduro bike (this is Transition Bandit with fox 34) and try some trails in Phoenix. My question is mostly about the shape of the trails. I really like to jump but I haven't seen any place in Phoenix which has a specially prepared trails for jumping, pumping and droping. I feel that it's mostly riding on a small stones and rocks. Do you have such trails or they all look like a singletracks? I've heard only about mesa bikepark, but I think this not a big trail and also I have around 30 miles there. I've already checked few mountain biking apps like Singletrack, Trailforks and MTB Project. I know some stuff but If you have any advice for a newbie I appreciate it. I also will be happy to ride with other bikers. Unfortunately my riding skills are not on the top level (especially if I have to pedal a lot ) also english is not perfect but I promise I'll try to do my best. Not much our here for specially prepared trails. Nearly all is natural terrain with varying levels of trail building/construction/smoothing to create different features. Plenty of tough trails however that do require all kinds of skill. Yeah, not a ton of options here for that style of riding, but you can still get your fix. As you mentioned the Mesa bikepark has some jump lines. The Estrella Foothills Bike Park seems to be coming along nicely, here's their facebook page. 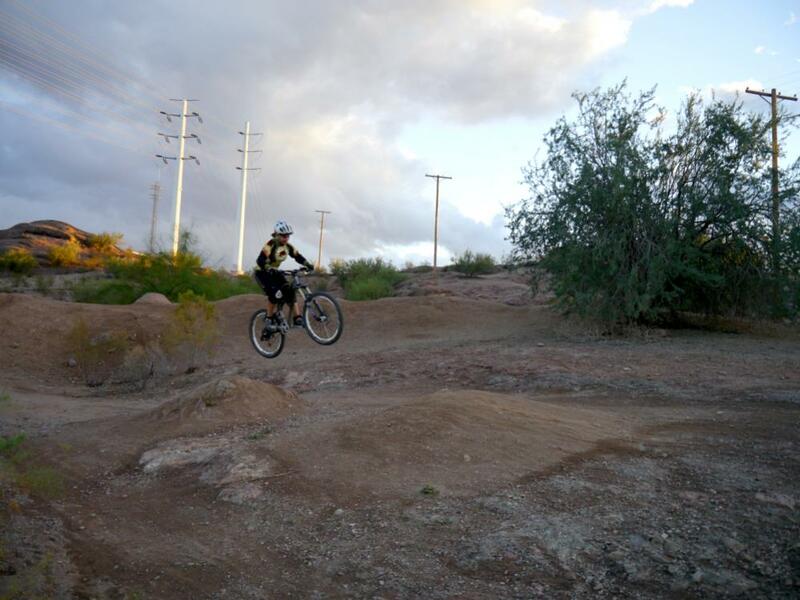 I think the jumps at Papago are still there. Over by the water treatment plant behind the Zoo. Small area, but there are some drops, gap jumps, etc. There's always the DH shuttle options at South Mountain. Trails like National heading east from the Buena Vista parking lot and Geronimo from the same lot. Holbert is a bit more chunky from what I hear, I've never ridden it, not my cup of tea. Welcome to the area and good luck in your trail search. I have the same issue, I love jumpy fast flowy trails, it seems the terrain offers the challenges of this type of terrain. Also I Don't see it being an impossibilty for trail builders to maybe make such a trail if they had the right conditions/ambition. I found a fun jump spot over off of Usery Pass RD off of the NRA Access Trail, that trail has some little jumps and flow but if you look for trails coming down the mountain about a mile into the NRA you will find very large jumps and gaps and drops with what your looking for. Some hits are in need some love but after being there they are good enough to go and if you want to bring a shovel I am sure many would appreciate it. The trail is on trailforks in Mesa area in between hawes and pass mountain. I can get you more exact spot if you want. Papago Jumps are still there and many are in good shape. Go check it out. Get involved with GRO AZ. Join the group on Facebook. Gravity Riders Organization of Arizona. this is likely your best way to get connected with like minded riders. Thank you all for your responses! It will help me a lot. I didn't know about this local spots and also never heard about the DH shuttle at South Mountains. I will definitely check it out. I also added myself to the GRO AZ group - thank you for this advice. Right know I spend most of my time in Phoenix Mountains Preserve because it is the closest spot from where I live but it seems that I need to explore more and more. Driverfound33 - I will be happy to get from you more informations. GRO-AZ is your best bet to get connected with the riding you like. Within that group, there are often trips to bike parks or shuttle days for Flagstaff, Mingus Mtn, etc. South Mtn has a pretty vibrant shuttle scene and GROAZ folks will help you find it, but its rocky trail riding not DH trails. Last edited by chollaball; 12-06-2016 at 12:00 PM. For the Somo Shuttles, check out AZ ShortBus. I hear Gnar Gnar Tours are running some shuttles again too. Papago is still legit. Most of the stuff has deteriorated but there's still a couple live lines. Was just out there last weekend gettin' shown up by youths on bmx. NRA is about the same story. Still there, some of the kickers and ramps still intact but a lot of the landings are in need of some help. The wash gap is still looking good and tons of fun. By the way you can pedal up many parts of south mountain for the long DH runs, no reason why you can't pedal national and drop geronimo. Thank you all! I have already visited Papago Park. It was veery nice and I feel much better. Some of the jumps are too big for me but lots of them are perfect. Could anyone tell me where is NRA? I read about it but couldn't find any information about location. Switch to satellite mode and you can see a large open pit, this is where most of the jump lines empty into. Ride south from the pit and you'll see the lines heading uphill, some go far up into the foothills there. What do you ladies do to cross-train/train during the off-season?